This morning marked my client’s second lesson in Western Boxing for Martial Arts Cross Training. We continued to develop footwork and the jab, and I introduced the cross. He also had an opportunity to engage in some light sparring. Training began with some muscle activation exercises. After some mobility exercises, we did some squats and movement patterns. I encouraged keeping movement on the toes and engaging the leg muscles. Then we began the footwork training in earnest. This consisted of movements forwards, backwards, laterally and then pivoting exercises. Then we layered on the jabs previously taught, punching every time the foot touched the ground. This exercise promotes good feet and hand coordination and helps eliminate hesitancy. The jabs were then brought into a partner exercise, where the fighter learnt how to parry as well as punch. We increased the amount of footwork as the exercise progressed. Next, I brought in the cross. This overlapped from his previous self-protection course, where the rear straight hand was taught as a primary offensive weapon. 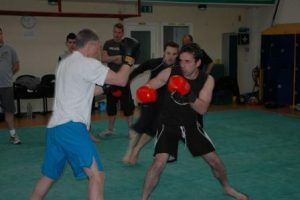 We then went back through the footwork exercises and trained the cross in isolation, and then as part of the one-two punching combination. Training then went live for a quick, light round of specific sparring. We focused only on attacking and defending the jab/cross. The lesson was finished with 30/30/30 technique/speed/power exercise. For 30 seconds the fighter trained jab cross with footwork, then as a speed punching exercise and finally power crosses off one side. This was then all repeated using a southpaw stance.